China's e-commerce industry is boosting the development of the domestic express delivery sector, which is gradually becoming smarter and more efficient. But the "aftermath" of China's annual online shopping spree, known as ''Singles' Day''- when hundreds of millions of tons of packaging waste is generated - is troubling the sector. This has led e-commerce firms and government authorities to show their determination in addressing environment issues, which analysts say is a good start, but warn there are still many hindrances ahead. Every day, a batch of parcels made up of unique packaging is dispatched from the express delivery station run by Ye Zhiwei in Beijing's Haidian district. "They [the goods] are packed in yellow durable and reusable plastic boxes, unlike many others, which are wrapped in one-time use cardboard delivery boxes or plastic bags," Ye, an employee of China's leading online-to-offline retailer, Suning Commerce Group, told the Global Times on Wednesday. After handing over parcels to buyers in person, deliverymen bring the yellow boxes back to the station to be reused. 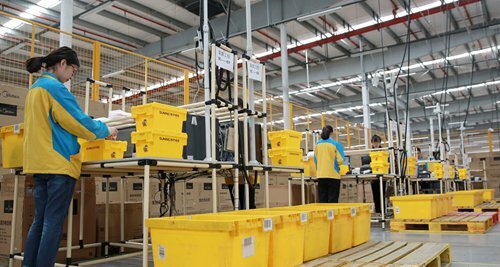 Suning launched the yellow plastic delivery box service in April, costing users no extra charges, but at the moment, consumers cannot opt for the service themselves. So far, Suning has introduced 50,000 yellow boxes into the market, mainly serving randomly selected buyers who purchase valuable and fragile goods like smartphones as well as maternal and child products. Shi Pengfei, deputy general manager at Suning's logistics unit in Beijing, said in a statement sent to the Global Times that the company is seeking to cut back on cardboard usage on environmental grounds, with the aim of gradually increasing the use of the plastic yellow boxes to 200,000 by 2018. Meanwhile, Suning is also reducing the use of paper and tape for packaging purposes and increasing the use of electronic waybills. Pollution and waste are two of the main problems in the domestic express delivery industry. Widely used packaging materials such as tape and plastic bags used in the sector contain components like polyvinyl chloride, which takes years to degrade. Shi said that burning those non-degradable delivery bags and tape can generate up to 30 million tons of carbon dioxide annually. The number of woven bags used for packaging purposes last year increased by 100 million pieces from 2015 to about 3.2 billion and about 8.6 billion cardboard boxes were also used in that same year, slightly down from the previous year's measure of 9.9 billion, data from the State Post Bureau (SPB) showed. In 2016 alone, there were 6 million tons of packaging waste generated in China and disposal costs were estimated to have stood at more than 9 billion yuan ($1.36 billion), according to a report by the Xinhua News Agency. "What the environment faces will become more serious if we do not pay enough attention to the waste generated from China's fast-growing express delivery industry," Shao Zhonglin, industry analyst at Shanghai-based yongyiresearch.com, told the Global Times on Thursday. Shao predicted that amid China's e-commerce frenzy, the packaging volume handled by express delivery companies on a daily basis will hit 1 billion parcels in the next seven to eight years from the current measure of 100 million per day. The nationwide Singles' Day online shopping festival, which started over the weekend, is expected to lift the number of parcels handled between Saturday and Thursday by 35 percent from the same period last year to 1.5 billion, according to the SPB's estimates. Each yellow plastic box can be reused more than 1,000 times, which means a 10-year-old tree can be saved, Shi said. Suning expected to reduce the consumption of 1.1 million cardboard boxes during this year's Singles' Day shopping bonanza by promoting the yellow plastic box initiative in 13 cities across the country. But Suning is not the only firm dedicated to greening the courier sector. Alibaba's logistics arm Cainiao launched a cardboard box recycling program on Sunday across 10 Chinese cities, including Beijing, Shanghai and Guangzhou, South China's Guangdong Province. Specialized staff and vehicles are being sent to collect cardboard boxes from consumers, and consumers are being encouraged to donate boxes at Cainiao's designated distribution centers in return for shopping coupons. Cainiao predicted that the program will recycle tens of millions of cardboard boxes, saving nearly 100,000 trees, according to a press release the company sent to the Global Times. These firms' moves are in line with Chinese regulators' requirements. The SPB on November 2 issued specific goals to green the domestic delivery industry. By 2020, 90 percent of waybills should be electronic, half of external packages should be degradable, packing material used for each parcel should be reduced by 10 percent and tape and woven bags should be gradually replaced, according to the SPB. Apart from environmental protection, saving on costs appears to be another factor encouraging express delivery companies to actively embrace green delivery. Since August last year, paper prices have surged. By the end of September, the average price of corrugated paper - which is widely used for packaged goods sold online - surpassed 5,200 yuan a ton, up 104 percent year-on-year, data from Shandong-based commodities consultancy SCI99 Inc showed. According to Suning's estimates, cardboard box costs have risen 20 to 30 percent this year from a steady level in the past, but its reusable yellow plastic box initiative can help the company save about 95 percent on costs compared to one-time use cardboard boxes. A Cainiao representative noted in the press release that the company's paper box recycling program can help save nearly 100 million yuan in costs. Analysts said that firms like Suning and Cainiao are setting a precedent and making an exemplary start, but that there are obstacles lying ahead. Shi admitted it is taking more time than expected to persuade consumers to accept and support the yellow plastic delivery box service. For instance, "some customers want to keep our plastic boxes for their own use and some do not want their online purchases to be delivered via reusable boxes as they are concerned about box sanitation," said Shi. In addition, Shao worried that deliverymen may lack the enthusiasm to collect empty boxes from consumers, which could slow down their work efficiency. The empty boxes may occupy so much space in their delivery vehicles that they may be unable to store new packages and receive new orders, he noted. "Domestic deliverymen are paid based on how many new orders they process." However, according to Ye, he and his colleagues do not think collecting plastic boxes from buyers causes them work overload. After all, only five to six plastic delivery boxes are handled by Ye's station every day, which is a small proportion of the 600 to 700 total parcels it receives daily. "I do not think all the paper delivery boxes can be replaced by plastic ones," given there are no one-size-fits-all plastic boxes yet, said Ye. "It's impossible for the company to churn out various sizes of [reusable] plastic boxes for different goods categories due to cost concerns."